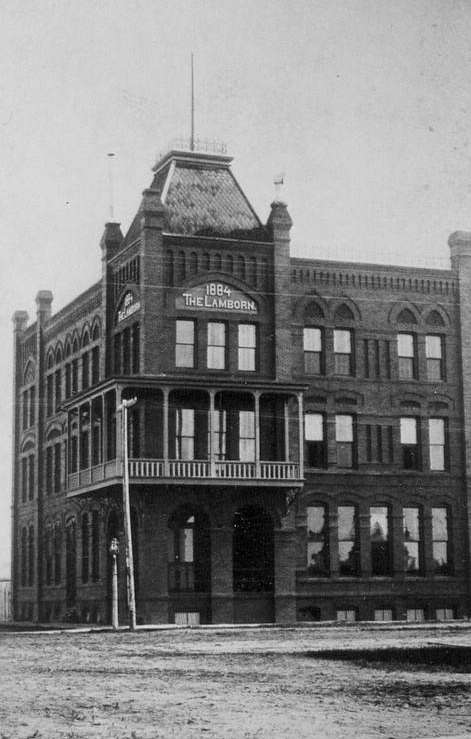 The Lamborn Hotel was an ill-fated hospitality entity in Bismarck’s earliest days. The Lamborn Hotel was financed and built by Richard Mellon (of the famous Mellon Brothers) and political boss Alexander McKeznie, and named after Colonel Charles B. Lamborn, who was a land commissioner for the Northern Pacific Railroad at the time. Construction on the building was completed in December 1884, just in time for the upcoming legislative assembly. For reasons unconfirmed, it appears that the Lamborn Hotel never actually opened for business. Instead, the first hospital in Dakota Territory was established at the building, as Lamborn Hospital, in or around June 1885. That hospital was renamed Saint Alexius in 1887. The Lamborn Hotel Building was demolished as part of an urban renewal project in 1972. Prior to demolition, the building housed Bismarck Business College. The building was located on the northeast corner of 6th Street & Main Avenue, where Radisson Hotel now stands. This building was an apartment building in the 60’s. The family of one of my best friends managed the building at that time. Not sure when it was converted to apartments.